Everyone remembers the tragedy that was 7/7. In 2005, 4 suicide bombers killed 52 people. A further 800 were injured. Whilst it's still resonant to us, it's even more so for the survivors who today launched legal proceedings after the Home Office refused to hold an independent public enquiry. Lawyers have said that the group of survivors involved want the hearing to 'ensure lessons were learnt in the future'. Oury Clark Solicitors feel the government has not engaged with their clients. The Home Office, instead of responding a letter written by the group by the deadline of 24th August, it replied saying it would respond by September 7th. However, the deadline for judicial review proceedings was 30th August and the group were forced into litigation proceedings. In plain English, this means legal action. The group have said that they will stop proceedings if the public enquiry is launched. They think that the more public interest there is, the more chance of people really finding out what happened that day. It seems that whilst London has moved on in some ways from these tragic events, those directly involved need to know more about the events leading up to the bombing so they can attempt to put the past behind them. 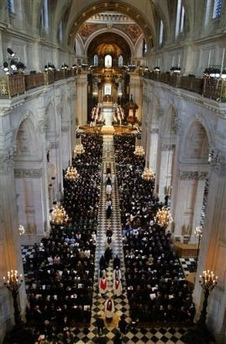 Flickr image of St Pauls cathedral bombing memorial taken from Annie Mole's photostream.